Last Saturday, I had to go down to watch the game between Monterrey and America. Monterrey won (obviously) by a wide margin: 4-1. 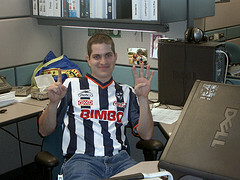 Ex-fan of America and newly rayado Mauricio Capistran (Picho) stoically paid the bet between us by wearing Monterrey’s shirt all day at work. To make things worse, the shirt says Bimbo – a sure way of getting people to ask you why you’d wear such shirt. Please note the flag in the back of the picture. We promptly proceeded to burn it. chales, ni a cual irle. a ver si un dia los mandan a los dos a la MLS.